Infamous shatters the poised facade of fame with a palette that can't conceal its dark side. Liquid night tones of glittering black, deep crimson and smoky teal step into a spotlight punctuated with opulent gold sparkle, flashes of brilliant red and smooth frosty ivory. The crowd is restless. An eclectic mix - different cultures, different styles, different lives. But they're all here for one thing...the music. In The Mix turns up the volume on a street-inspired palette of rich and riotous color. An irresistible compilation of bright coral, fiery fuchsia, and electric blue synthesizes with plum and a mosaic glitter that will have you feeling the beat. Next stop, the dance floor. Sugary sweet has never been so good for you. This spring we unwrap six new colors pulled straight from the shelves of your favorite dessert memories. This collection indulge in all things that sparkle and shine. Crank up the volume on color with a delirious palette of metallics, glitters, and exploding sequins. Stand out with a double dose of glitter adorning your fingertips. Let your inner bling queen rejoice this Holiday season with Sparkle. This collection seduces us with a deeply enigmatic palette that comes alive as your eyes adjust to the light. Bold, saturated colors are inspired by shades worn on the smokiest of eyes. Dusty tones are blended with matte shimmers, creating an elusive yet intriguing mix of hues. Bring yourself to the dark side of beauty this Fall with Smoky. Infused with heat-treated pigments and specialty micas plus Vitamins A, E and B5 to help nourish and protect nails. Bring out of this world nail effects to your tips with Galaxy FX, the latest innovation from Orly. These shades were modeled after constellations to create a galactic look on your nails. Transform your glossy manicure into the perfect velvety, matte finish in minutes with Orly Matte FX. 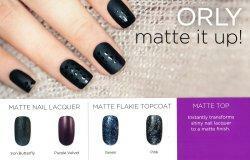 Two Matte Flakie Topcoats give nails a matte shimmer finish. Channel the dramatic. The aristocratic. The captivatingly lavish. Shroud yourself in provocative opulence as you're transported behind the walls of an intoxicating world with Secret Society. This season, obscure the line between real and virtual: Marvel in the mystical. Channel the magical, the ethereal, the eclectic, the unexpected. Drench yourself in a sweet dream-like daze - and take nails psychedelically off-center with Surreal, the new Fall 2013 color collection from ORLY. 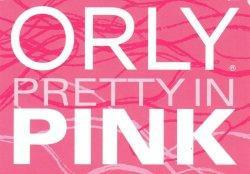 Help support early cancer detection.